Ex Astris Scientia - Which is the Peregrine Class? Which is the Peregrine Class? The purpose of this little article is to attempt to link the class name "Peregrine class" to one of the visually known starship designs of the Maquis. Kira: "They've just been attacked by a Maquis interceptor." Odo: "Long-range sensors are detecting a modified Peregrine-class courier ship. Lightly armed, one man crew, bearing 268 mark 301." 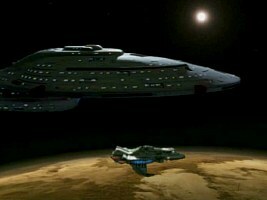 Kira: "The Maquis use Peregrine-class courier ships." Kira: "I don't know what the Maquis have done to that ship's engines, but it's *fast*." Odo: "Not fast enough... we're closing on him." Kira: "We better catch him soon, we're entering the Badlands." Kira: "He's gotta be somewhere in this solar system." Odo: "There he is. Looks like he's trying to land on one of the moons orbiting that gas giant." The Peregrine class is familiar at least to Kira (Odo may have just been reading what the sensor recording said). 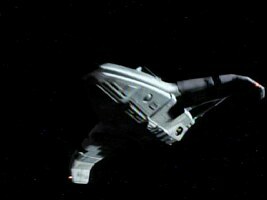 Although it was just a deception fabricated by the Dominion, the vessel was plausibly recognizable as Peregrine-class courier to the sensors. In other words, it may not have been heavily modified (except for the engines). The Maquis are using vessels of this class, but they may not be the only ones. It was just Kira's obvious conclusion that the particular vessel must be of the Maquis. The Peregrine class must be very small, with just one man crew. The Peregrine class is said to be a courier, and to be lightly armed. Looking at the visually known vessel classes or types of the Maquis, we can distinguish the following four candidates for the Peregrine class. None of them was ever verbally identified with a definite class name. Every such information is apocryphal or from behind the scenes. 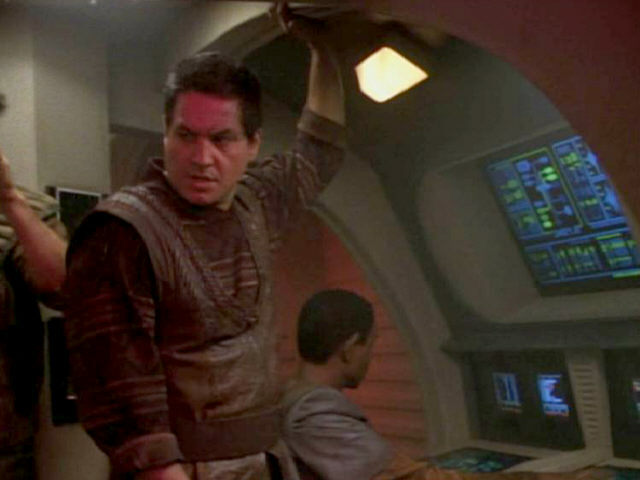 The issue of size vs. crew complement regarding Chakotay's raider type I is discussed in Voyager Inconsistencies. The controversy over the individual name and the class name of his ship, however, is almost irresolvable. More about that in The Antares Class(es) and the ship's entry in the Starship Database. Anyway, the already existing name confusion as well as the crew complement make it is easy to rule out the raider II as a possible Peregrine class. Likewise, it appears little probable that the big Bajoran assault vessel, perhaps a genuinely Bajoran design but surely not one of the Federation, could be the Peregrine class. This leaves three candidates for the Peregrine-class courier: the raider I, the Federation fighter and the small raider. The small raider I is in fact the original configuration of the model which was later modified (most noticeably with a bridge module in the place of the former cockpit) to act as Chakotay's raider II in "Caretaker". The modifications on the outside are not really extensive though. 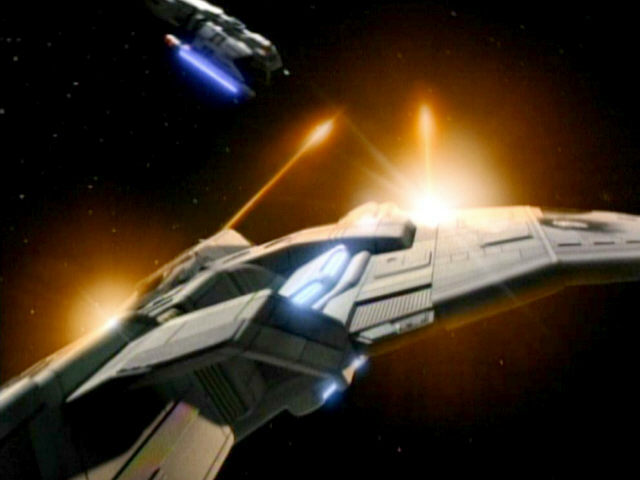 We can see the raider type I only in TNG: "Preemptive Strike" where it appears to be just as tiny as the fighter type which appears in the same scene, attacking the Cardassian Galor class. The comparison with the Galaxy class (when Ro Laren and Riker clandestinely penetrate the aft shields to steal supplies) would allow a length of roughly 40m, however. The cockpit is relatively spacious and seems to be a redress of a set that has been used for various alien shuttles in TNG. Raider I and Galaxy in TNG: "Preemptive Strike"
Raider I cockpit in TNG: "Preemptive Strike"
Raider II and Intrepid in VOY: "Caretaker"
Raider II bridge in VOY: "Caretaker"
Overall, the sizes of the two ships as they appear on screen are so close that in my personal ruling they are the same basic design and naturally the same size. This would not preclude that the small raider could have a different class name. But with the modifications that would allow to distinguish two classes apparently done by the Maquis themselves, there probably wouldn't be a commonly known class name like "Peregrine" for one of the variants. The size of the Federation fighter varies, but is half-way consistent at 25m or less. If we discount the wings and engines, the usable internal volume of the fighter can't be much more than inside a smallish shuttle. Indeed, the fighter cockpit from DS9: "The Maquis, Part II" looks like that of a shuttlepod. Fighter and Danube in DS9: "The Maquis, Part II"
Fighter cockpit in DS9: "The Maquis, Part II"
Sisko: "I'm picking up another ship moving toward them." Dukat: "That's a Federation signature I believe, Commander." 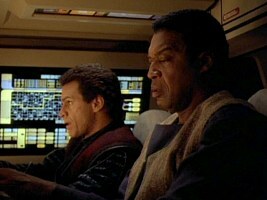 Sisko: "It sure isn't from Starfleet. I've never seen a ship configuration like that before. It almost seems like someone has modified an old support courier. Hailing them... no response. They've fired torpedoes! What kind of civilian vessel that size would be carrying a photon?" 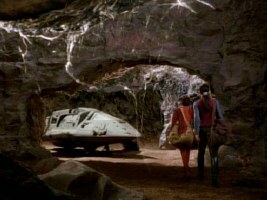 Alas, only the term "courier" creates continuity with DS9: "Heart of Stone". Unlike Major Kira in "Heart of Stone", Captain Sisko who has been working at Utopia Planitia for at least three years, does not recognize the vessel. We have to concede that "Heart of Stone" takes place one season later and that the class, like the Maquis, may be better known until then. Yet, if the appearance of the class is unfamiliar to Sisko, it must have been heavily altered, which is evidently not the case with the Maquis and the Federation version of the fighter (only the introduction of a CGI model in the Dominion War may have established slight dissimilarities between the two). And if Starfleet possesses fighters looking just like the Maquis ship that Sisko spots, wouldn't he much rather identify it as a modified Starfleet fighter instead of an "old [civilian] support courier"? It is still possible that Starfleet converts old civilian couriers or even Maquis ships to fighters for the Dominion War, but that would be a stretch. On the other hand, the plot logic in "The Maquis" suggests that the unseen vessel attacking in part I should be the same as the fighter seen in part II. Quark was involved in a deal in the course of which the Maquis acquired various weapons for their ships, including photon torpedoes. It is most likely meant to be the same vessel class around which the whole story is revolving, especially since this is the first episode with the Maquis and the later fighter is their first and only ship type at the time. Alternatively, the unknown courier in DS9: "The Maquis, Part I" and the familiar Peregrine-class courier in DS9: "Heart of Stone" do not have to be the same design. In this case the ship that Sisko doesn't know could easily be either the Maquis raider I or the Maquis raider II. 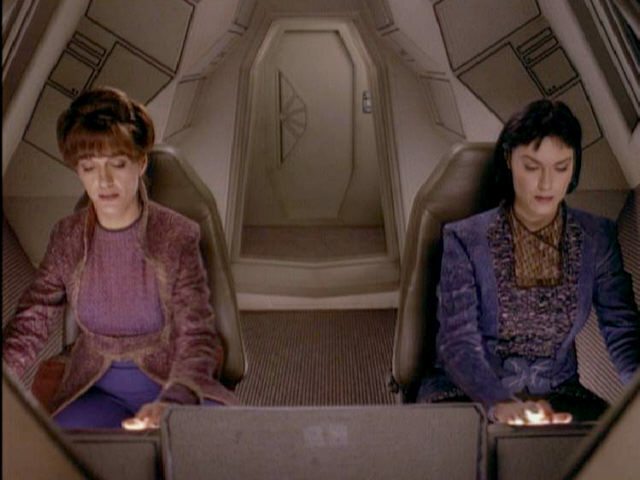 The bridge on the raider II instead of the familiar cockpit (rather than vice versa) may be just the unknown configuration that puzzles Sisko. This little ship, like the much bigger assault vessel, is more commonly known as a Bajoran design, although we could see both take part in a Maquis attack in TNG: "Preemptive Strike". 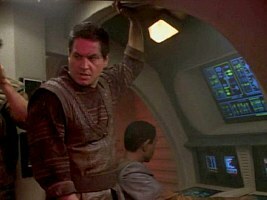 The cockpit of the small raider that was visible in the latter episode, however, insinuates that it could be a Federation design. 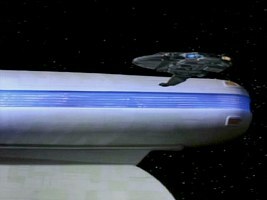 On the other hand, the ship did not even have warp drive when it originally appeared as a Bajoran vessel in DS9: "The Siege", and it was not called by its class name by either Kira or Jadzia. My impression is that the small raider is not the courier that we are looking for. Subimpulse raider landed in DS9: "The Siege"
Subimpulse raider flight in DS9: "The Siege"
We have no ultimate evidence whether the "small" Maquis raider type I, the Federation fighter or rather the small (Bajoran?) raider is the true Peregrine-class courier. The fact that the raider type I could have been anything else prior to its service with the Maquis, while we get the impression that the small raider is not a warp ship and the fighter does not really qualify as a courier either seems to establish a slight preference for the Maquis raider I. Yet, it is possible that the small, fast and maneuverable fighters are in use as couriers as well. This is an option, since they are probably not designed to carry goods but rather information and/or single individuals for which the fighter type may be big enough. The raider type I, on the other hand, shares the class name confusion of the type II to some extent, for I believe they are the same basic vessel and the same size. If the two were really different and the raider I were somewhat smaller, I would favor this one as the Peregrine class. But presently I have tagged the fighter type as "Peregrine class" in the Starship Database. Finally, there is still the chance that the Peregrine is neither of the three candidates and we have never seen it. Thanks to Guardian 2000 who brought up new evidence in a discussion at the Flare Forums in 2004. All quotes from episodes are taken from his posts. All screen caps provided by Jörg (as usual).